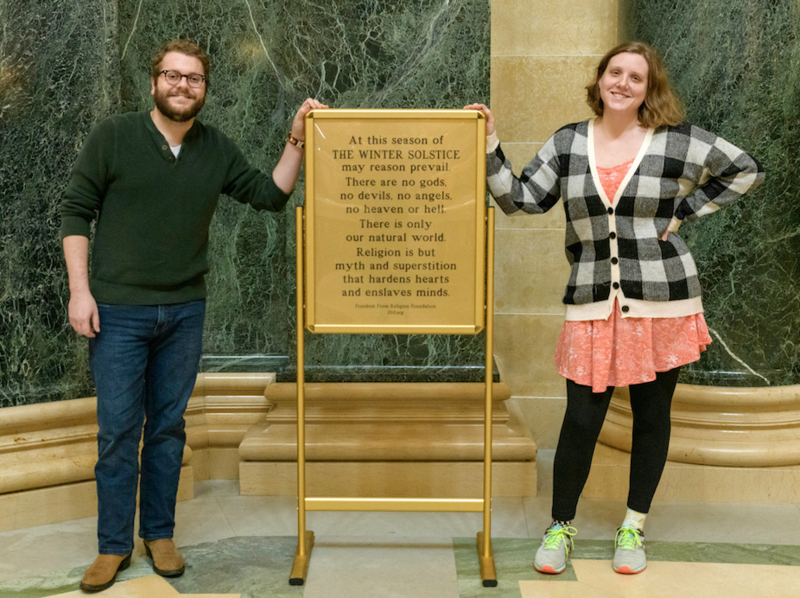 The Freedom From Religion Foundation’s annual Winter Solstice exhibit became available for public viewing at the Wisconsin Capitol today, Dec. 3, for a remarkable 23rd year running. 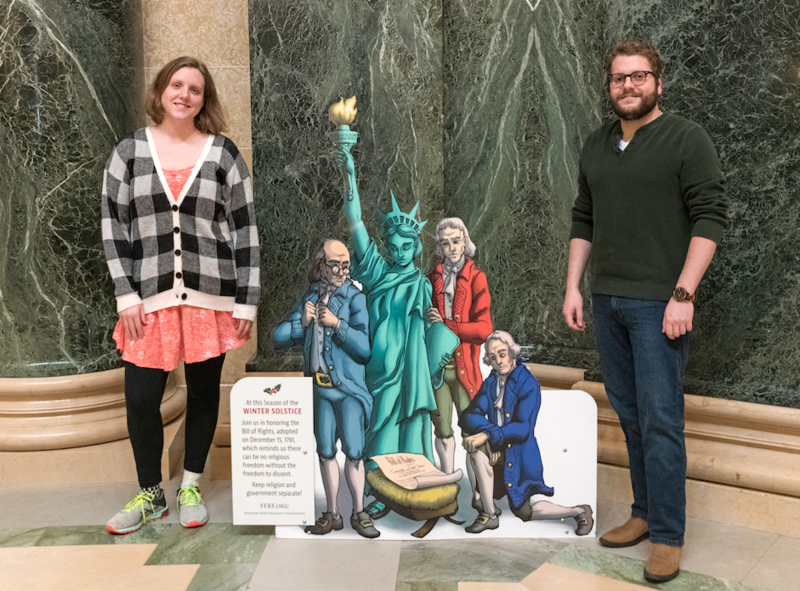 A major part of the exhibit for the fourth year in the first floor rotunda is FFRF’s whimsical Bill of Rights “nativity.” The irreverent cutout by artist Jacob Fortin depicts founders Benjamin Franklin, Thomas Jefferson and George Washington gazing in adoration at a “baby” Bill of Rights while the Statue of Liberty looks on. At this season of the Winter Solstice... Join us in honoring the Bill of Rights, adopted on December 15, 1791, which reminds us there can be no religious freedom without the freedom to dissent. Keep religion and government separate! The exhibit is permitted to be up until the end of December. Occurring on Dec. 21 this year, the Winter Solstice marks the shortest, darkest day of the year, heralding the symbolic rebirth of the sun. It has been celebrated for millennia in the Northern Hemisphere with festivals of light, evergreens, gift exchanges and seasonal gatherings. The national state/church watchdog, based in Madison, Wis., has approximately 32,000 members and several chapters all over the country, including almost 1,500 and the Kenosha Racine Atheists & Freethinkers (KRAFt) chapter in Wisconsin. Thanks to FFRF Legal Assistant Whitney Steffen, Legal Fellow Colin McNamara and Chris Line (photographer) for placing the signs.